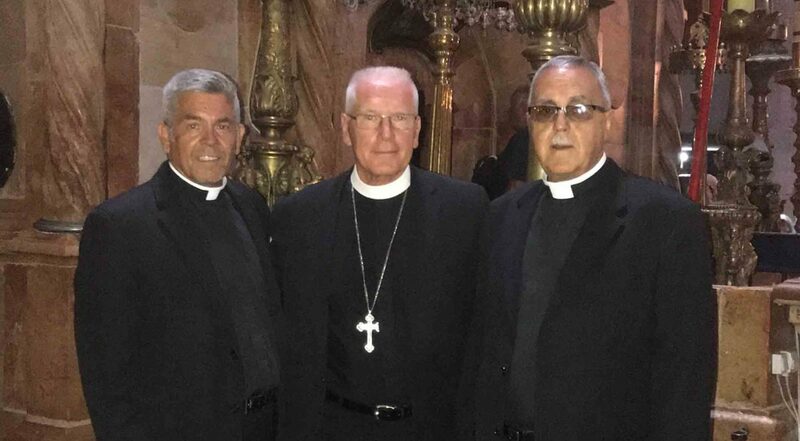 Writing this while visiting Jerusalem as ecumenical observers of the 2018 Global Anglican Future Conference, we had some time to visit the Old City, the Way of Sorrows of our Lord’s procession from Pilate to the empty tomb, and other significant locations from the life, death and resurrection of our Lord and the early Church. Along the way, we were blessed by our colleague, interpreter and “tour guide” for this trip, Pastor Bassam Abdallah, a retired NALC pastor, who was born in Jerusalem but served his entire ministry as a Lutheran pastor in the United States. While this takes place in a variety of ways for different persons, it seems to be manifested most commonly among Christians who come to Jerusalem expecting to find Jesus, expecting to have a transformative spiritual experience. Despite being overwhelmed amid the myriad significant historical places, churches and shrines, these persons are also disappointed that they do not “find” or “experience” Jesus as they had expected. They do not have the long-hoped-for, life-changing transformation they traveled so far to finally receive. torture, the Church of the Holy Sepulcher — as we ponder and pray about our Lord’s passion and death, for us and for our salvation. While visiting Jerusalem is a high point of my life, I did not come looking for Jesus in some unique or transformative way, nor did I expect to encounter the Risen Christ in Jerusalem. A visit to the Holy Land can be interesting, renewing and powerful in bringing the accounts of Holy Scripture to life in a new and concrete manner. But you don’t need to come to Israel to “find Jesus.” Why? Because the good news is that Jesus is no longer tied to Jerusalem or the Holy Land! Jesus is not holed up in the churches, shrines and streets of the Old City, waiting for us to come visit him if we have the time and money to make the pilgrimage. The good news is that “the Word became flesh and dwelt among us, and we have seen his glory, glory as of the only Son from the Father, full of grace and truth” (John 1:14). The good news is that our risen, ascended Lord is with us, in Word and Sacrament, where two or three are gathered in his name. body to discover Jesus in far-off, hard-to-reach places. Rather, God is with us wherever the Word is read and shared. Jesus is with us as we receive him in the foretaste of the feast to come, in Holy Communion. God is with us at prayer group, potluck, hospital or bedside, as two or three disciples gather together, in Christ’s name. As biblical, sacramental Christians, we take seriously Christ’s real presence among us, where we are, where we live and move and interact — not in Jerusalem or Rome. Our worship is not focused on us and our ability to spiritually perceive and connect with an abstract, ethereal Lord present only for those spiritually attuned enough to experience him. The good news is that Jesus comes to us, and his is an “objective” presence — he comes to us regardless of us. He comes to us even when we are so troubled or distracted in life that we fail to see him or know that he is with us. His presence is not an accomplishment or a destination for the hyperfaithful, but the gift of God for those of us who are not saintly, or sanctified or prepared. This is the good news. And this relates to ministry in the NALC and in our congregations because we often fail to understand this ourselves or to share it with others. It may be that these “Jerusalem syndrome” Christians go looking for Jesus in Jerusalem because they do not grasp the miracle of the Incarnation — the good news of “God with us” in Word and Sacrament. If we think of Jesus’ presence as a spiritualized presence, then perceiving his presence often depends upon our persistence in seeking him and finding him. Most of the time, I am not so spiritually perceptive or sensitive. I am a Lutheran because we believe that God comes to us, that Jesus’ presence depends, not upon me and my spiritual extra-sensory perception, but upon the Holy Spirit and the Word of God. The more we lift that up in our congregations, celebrating God with us, incarnate, present objectively in the Word and the Sacraments, the more we may find the lonely, the sick, the lost — yes, the sinner — joining us as we gather around Christ’s real presence among us. Let us have Word and Sacrament be the center of worship and of our life together as Christians, Lutherans and the NALC. Let us worship as if Christ is truly present — because he is! Let us commit ourselves to reading, studying, living in the Word, because the Word proclaims Jesus, crucified, risen and now present with us. Let us so conduct ourselves in our congregations, homes and families that we respect and reflect the very presence of our Lord Jesus, with us every moment of our lives — and with us until the close of the age. Let us share that real, true, objective presence with others, as we connect with visitors, neighbors, friends — life to life, one on one — in home and church and daily life, that Jesus may reach them, through us.